I was asked about doing a tutorial on soldering. So here it is. Soldering is much easier than it looks - with a bit of practice you can be making bezels, joining bits of wire and much more. Main things to remember are clean joins and to heat the piece not the solder. Spending time getting everything nice and clean and properly in place before you get the blowtorch out is important. Notice how much time, even speeded up, I spend aligning the piece of silver in this video. I've heard the word "light-tight" used to check a joint is ready for soldering - if you can see air between the two bits of metal, your joint isn't lined up correctly. Some people say solder won't fill gaps, but it will. That's not an excuse to not having your joints line up though! 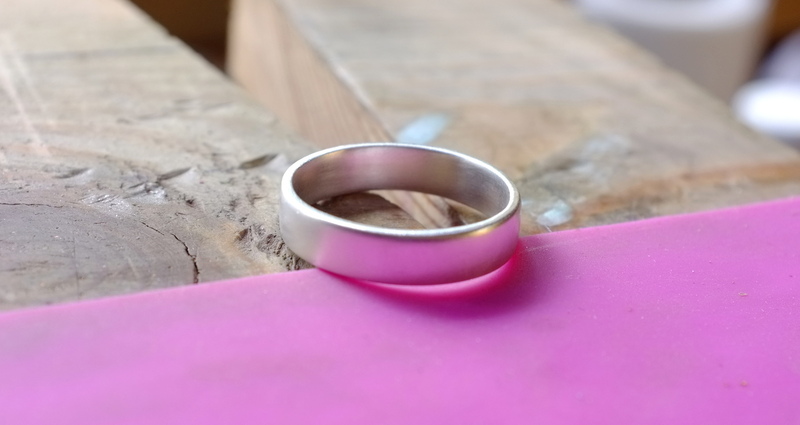 This ring was only polished to about 800 grit (the radial polishing discs you see towards the end are awesome!) so it's still a little satin-y to look at. There's nothing to stop you polishing it all the way to a bright mirror finish though. A good solder join is completely invisible - at the end the join is pointing directly into the camera and you still can't see it. Anyway, here's the video. Check the swanky new two camera setup! Click through to YouTube for lovely HD version, and please check out my Etsy shop too. Hello. Which solder material did u use and what was flux for this.